It is a packed, very hot and an incredibly sweaty Fulford Arms that greets us tonight. This show – part of local live music promoter Please Please You’s 10th birthday celebrations and their ongoing spectacular September gig schedule – was originally planned for the larger Crescent Working Men’s Club, but electricity problems there forced the change of venue. As Stephen Black – the man who is Sweet Baboo – suggests later on that at least the absence of power would have made it much cooler. But the febrile environment merely adds to the atmosphere and sense of occasion. 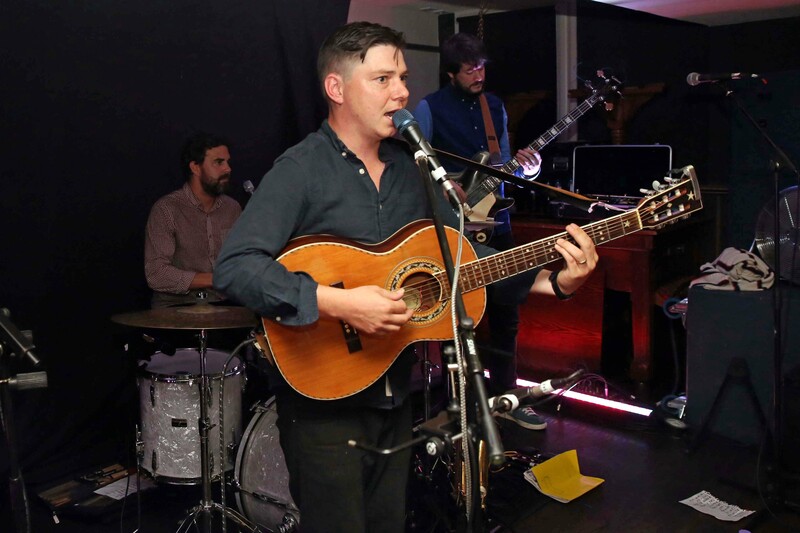 Arriving just to catch the very tail-end of The Lungs – the York country/folk duo comprising vocalist Bonnie Milnes and Theo Mason Wood on guitar and vocals – the rousing reception afforded them indicates they have put in an impressive shift. It is a momentum that Piney Gir is more than happy to carry on. Piney Gir is from Kansas. She tells us this towards the end of her wonderful set, though, in truth her sparkly red shoes had already given that particular game away. She likes to say “howdy” to strangers and her music captures perfectly those elements of innocence, confidence, undeniable warmth and a certain quirky charm. She also likes guises; a reference to the multitude of musical projects and collaborations in which she has been involved over her twelve-year career and the huge variety of venues she has played. It could also describe her music whose protean shape gleefully defies broad categorisation. There are all sorts in there, from mid-60s pop to classic country and new wave to neo-soul. Yet, for all of their stylistic diversity, her songs achieve a most compelling coherence. Backed by her superlative six-piece band on what is the last date of their tour, Piney Gir draws extensively from her sixth and most recent album, mR. hYDE’S wILD rIDE. The early Hallowe’en single ‘Ugly Bones’ is suitably scary and the ensuing ‘Universe’ moves beyond the parameters of time. She tantalisingly invites the audience to take her and her band home with them, before advising that it would be in CD and vinyl format only. On this evidence alone I think that would be more than enough. “Hello. Here we go then.” And with this typically unassuming introduction Stephen Black launches Sweet Baboo the band into orbit for the next hour and a half. It is an enthralling, often beautiful trajectory that takes in much of The Boombox Ballads – just like Piney Gir, it is Black’s sixth and most recent album as Sweet Baboo (if you take account of last year’s The Marc Riley BBC Sessions) – but also finds time to stop off at a few more familiar staging posts along the way. The newer material – performed here by Black and his four musical cohorts, including on keyboards Paul Jones, the man who was arranger-in-chief on The Boombox Ballads – reinforces Stephen Black’s decision to concentrate more on his vocals on the new record. For ‘You Are Gentle’ – a delicately simple yet equally infectious pop song – he sheds his guitar and embraces the mantle of some modern day Harry Nilsson, Randy Edelman or even Van Dyke Parks. In the same song, he picks up the saxophone and together with Rob Jones’ trumpet, their glorious brass-crossed-wind lines provide additional heft to the song’s already very strong melody. The next single ‘Walking In The Rain’ is Black’s stated effort to become the new Fran Healy, something that has been temporarily thwarted by a combination of the weather and, rather astonishingly, having received no plays thus far on the BBC. ‘Sometimes’ is similarly enhanced by a powerful brass/wind arrangement in which Black and Jones assume the sound of some defiantly proud colliery band; ‘Two Lucky Magpies’, where he is just accompanied by Paul Jones, is a deeply moving ballad; and the ensuing ‘You Got Me Time Keeping’ shifts mood and gears as it transforms into an epic prog-rock wig-out. Yet for all this musical and personal expansion, Black’s songs still thankfully retain all of their quintessential, slightly off-kilter, almost child-like charm. Sweet Baboo finish with an astonishing ‘Let’s Go Swimming Wild’, still surely the best song in Black’s entire catalogue, as he wanders off into the crowd to sing its euphoric refrain. Despite the stifling heat, the band play what are two clearly unplanned encores. First we get Black by himself performing a delightful ‘Bounce’ before the full band reconvene for a joyful blast of ‘Twelve Carrots of Love’. Just like the entire evening itself, Sweet Baboo’s performance is what can only be described as an absolute triumph.